Having chilled the hell out after last post, I was inspired by Iains comment to get off my whiney arse and just find some fun. I mean, if he can provide options from the other end of the country I can surely just grab a map and go looking, right? With a couple of hours to spare, I was sure I could at least try to figure out a reasonable route to and from one of the near-ish bits that I'd been shown by the local club. 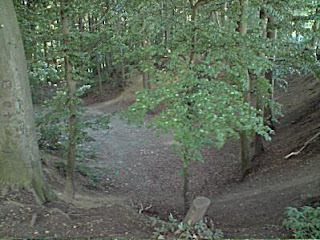 I did have another motive, too: The big hole in the ground near Stonesfield scares me. I'm not even close to going down the Big Side of it, but even the not so huge drop terrifies me. Until this expedition, I'd been there twice with the club. The first time it was dusky and rainy and very very wet. It was my first time out on my bike. I'd set off without having had chance to eat anything that evening, and we reached the woods about an hour and a half after I'd set off from home. I was already shaky from hunger, and by the time we'd climbed up through the woods (about 5 minutes of fun) to the main event, looking down it there was just no way I was going to ride it. None. I made my apologies, and one of the guys showed me the way around. Second visit, again with the club, was at least a sunny evening. There were a few more people around, and as we rode up through the woods I could feel the apprehension growing. By the time I got to the top, I was absolutley bricking it again. This time, I was determined to ride it. I know in my head it's not that big, and it's not that hard. Just keep my weight back, hands off the front brake, let the bike do its thing. It'll be fine. Plus, you're at the top now. Too late to turn back. Nice one! You've totally fooled yourself into going down! Ahahahahaaa! Unfortunately I was so caught up tricking myself into actually trying it that I hadn't bothered to check out how to ride it out once I reached what I thought was the bottom. It's not, there's another much moroe gentle drop after it that you need to turn into. If you don't turn, you end up ploughing straight into the other side of the bomb hole. Straight into a wall of roots. Which I did, then fell off and spent the next five minutes changing the inner tube that I popped with my crash-stop. So, on the whole I'm feeling a bit better about it - hey, I mostly rode it. I actually got it together enough to try it. But, if I'm going to be honest, I didn't really ride it. It was a mess, I didn't have my head together, and mostly I just chucked myself over the edge before I noticed. And I'm not really feeling that much better about it... It still scares me. A lot. So. The only sensible thing to do is ride it more, right? And now, with my determination to go out and ride is the perfect time. Perfect. I'm a little worried about going out by myself, but I'm pretty sure that I'm not going to manage to mangle myself that much if it goes wrong. So I tell myself as I talk myself into going. Now, it's a fair ride out there, mostly on the roads. I'd spotted a byway that looked like it might get me a bit of the way there with some stuff to keep my mind occupied on the way, but when I tried to ride it it turned out to be pretty much impassable due to the four-foot-high nettle and thorn beds that had grown right across the track as far as the eye could see. I struggled through it a little way in the hopes it would clear up, but it seemed like a hopeless (and painful) job. I turned back, and resigned myself to just following the roads for half an hour. The whole time, I could feel the apprehension rising. By the time I reached the woods I'd worked myself up to a ridiculous state. I really, really didn't think this was going to go well. But I realised that if I turned back now, this was just going to get worse. A brief text message to some friends (just so I didn't feel like I was as alone as I actually was at this point), and I began the climb. By the time I got to the top, I was feeling physically sick with apprehension. But screw it, I came this far. Time to do it. Weight back, off the brakes, check the exit line, pretend like you want those roots to be there... GO! ...and I made it. The adrenaline rush, having worked myself up so much, was just insane. I was whooping like I'd just pulled the most insane stunt in the world, not ridden down something that - honestly - isn't really worth fretting about as much as I had. Now the big drop, over to the left... yeah. Maybe one day. I went down the leftish way (right as you look at it) - over the roots, not down the way my bike is blocking in the picture. 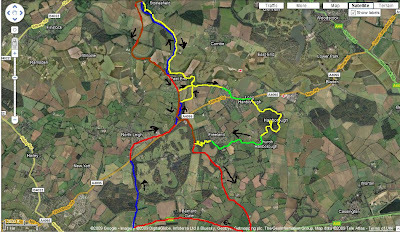 After that, I settled in to a nice hour of pootling around various bridleways on my way home. There's a fun rocky trail up to East End past the site of a roman villa which, while easy, at least feels like you're doing something (if you catch my drift), and the bridleway to Hanborough had enough uppy-downy ness to keep the euphoria of still being alive up. 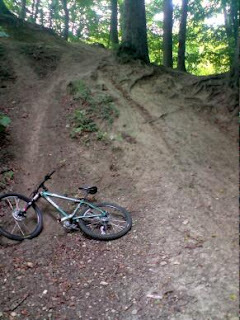 I burst into fits of laughter at my one bail of the day though - a totally hidden rut just next to the trail that I acidentally rode into. It was a little over wheel width, and deep enough that even with pedals level, I grounded instantly. Fortunately I was going slowly at the time, so just had to hop off. I had planned to head over to another wood for some more fun, but time had caught up with me. Time to head home on the roads, pausing only to provide directions to lost motorists on the way. I've been trying my damndest to get some off-road cycling in. 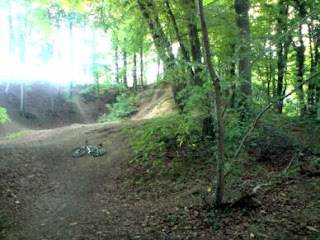 I tracked down a club near here, and I've been out with them twice (once in pouring rain, I chickened a few things, once in not pouring rain, and I rode everything I'd chickened the last time round - huzzah! I'm planning to take photos of the interesting bits, so I might post more here when I've done so). The problem is, whilst I really enjoy it, I don't really know where to ride, aside from the club (who I don't know yet) don't have anyone to ride with nearby, and on top of that, having ridden very little I'm not very good at it. That's fair enough; ride more and all will be well. I have friends who are range from very good to jaw-dropping (in my eyes), but none of them live near here, so I only get to play with them when I go a-visiting. They also have lots of fun stuff to ride over near them, so I'm eager to get good enough to be able to ride that without bricking it the whole time. Again, that's going to come with time and experience, I know. I've been trying for months now to put in the time and get the experience, but it feels like such a non-starter sometimes that I can't help but get a little discouraged by it. We've had such mental weather on the nights that the club has been riding that a few times I've just not bothered to turn up (Hey, I made it to the pouring rain one, but thunderstorms, and high wind + bucketing it down extreme weather combos are a bit much for me - I don't mind getting wet, but since I have almost 0 confidence in good conditions, riding in a storm just doesn't feel appealing). In addition to that, aside from literally three small bomb holes (pictures to follow, as promised above), the local riding I've been introduced to is far from technical. If you're cool with riding on medium-chossy bridleway, or slaloming a little through a flat wood then you're going to be pretty much sorted for everything round here, it seems. Not that it isn't fun, it is, I just don't really feel like I'm going to learn much from it, and more importantly from my point of view it's not going to help me build confidence on the bike. I've tried to hook up with a variety of people when Up North, but between more Extreme Weather, financial woes (mostly of others), and the pressures of fitting things in around family time it's just not been happening. This week, I realised that I'd left it somewhat late to sort out lights. I don't have any suitable to get me through even a dusky ride when we get to the fun bits (my recent experimentation has revealed), and it's getting darker from here on in. I've ordered some lights, but they're not going to be here by tonight, so that's going to be another week of not riding anything at all. I'm heading off up to Scotland early next Friday morning, and given I want to take both my bike and my Stuff with me, I'm not sure that I'm going to be able to fit in the 7-9 ride next Thursday either. I've also been looking at going on a skills course to try to learn something (anything! ), but so far that's been comprehensively stymied by every fricking course I could make it to being Women Only. I tried blowing off some steam about this to a couple of friends yesterday, and got pretty much blank incomprehension from them both. One outright said they couldn't understand why I'd want to do a skills course when there was nothing technical to ride round here anyway, and the other seemed to have pretty much the same opinion, but just didn't come right out and say it. Neither seem to really get why I'm so totally frustrated - both thought I should just "go out and ride more". It's easy to say that when you're surrounded by excellent riding and in the company of lots of other mountain biking folks all the time. I suspect I'm just annoying people by being all whiney at them. This is, I admit, pretty much par for the course for me (sorry). But I'm conscious that in a week and a half, I'll be back up where there are interesting things to ride, with people who are easily capable of riding them, and I'll be back to where I was pretty much where I started when I went up last time (i.e., terrified and clueless) due to lack of practice between then and now. By the end of the weekend, I'll hopefully feel a bit more confident again, and be having fun... only to come back home and do lots more Not Riding and lose it all. Again. Very very late in the day - just a couple of weeks before - I got a message from Ed saying he and Beth would be visiting that weekend. So how about doing this years Chilterns Challenge? Since I'd hoped to do it anyway, and was already training for a 100 mile ride from York later in the year, I leaped at the chance. The route was similar to last years and I'd really enjoyed that. It was a nice route, but it damn near killed me getting up those hills... Admittedly, I'd been doing almost no exercise that time round, and was riding a heavy rustbucket of a bike, but still. It was tough. So I had a little trepidation (to say the least) about how I'd find it this year. All the more because the weather forecast as the day approached kept tending more towards "you are going to melt". I can't remember what temperature was threatened, but it was alleged to be feeling well in excess of 30 degrees. The ednbeth arrived late on Thursday night in advance of the ride. We decided to leave the bikes in the car and sort out taking them round to the garage the next morning. Which we did - along with my shiny new secondhand Kona Caldera which they'd brought down from Glentress for me (yup, I got the bug... although where I'm going to find mountains round here is anyones guess - more on that in subsequent posts, I suspect). Unfortunately, Ed decided to ride Beths bike round to the garage while simultaneously pushing his. And fell off, tacoing his front wheel, bending his bars, mangling his grip tape and nearly severing the cables on that side. Fortunately, he had a couple of days in hand to Do Fixing and by the time Saturday night came, his bike had been bludgeoned back into something approaching a rideable state. The night before the ride, we cooked Epic Pasta and resolved to get up before six, in a bid to beat the worst of the afternoon heat. Shockingly, we did so. After a couple of false starts (forgetting such vital tools as a pump the first time round), we were off. Arriving at Henley, we found the tiny car park at the start absolutely rammed with cars, but through some sneaky parking-on-the-driveway we managed to bag a plot and begin assembling our glorious steeds. A brief queue for registration, and a mere quarter of an hour or so of faffing around later we were off! ...for all of about three minutes. And then we realised we'd forgotten the sunscreen. Ed, bless his enthusiastic little socks, decided he was the person to ride back to the car, grab the cream, and catch us back up. Beth and I were to pootle along until he caught up. And pootle we did. After a little while, we were beginning to get concerned that he'd maybe missed the first turn. We were just about to turn back and go searching when we saw him in the distance, bombing up the road. It turns out that our pootle was a bit more like a brisk zoom, and poor Ed was now wrecked already from trying to catch up with us. Oops. Still, he had some respite while we gooped up. But not much. For we'd managed to stop at the start of the first big climb of the day... now, I remembered this with much trepidation from last year. The two big hills on the route had very nearly finished me off, and I'd been worrying that this year would be no different despite the training. I was both surprised and delighted to scoot up the first one pretty easily - so much so that I found the energy to wonder why the fellow in front of me was insisting on wobbling all over the road rather than just dropping gears and spinning more, like I had. It's not like he was going any faster than me, and I was having a much easier time of it... As an aside, I should mention that this is something I really don't get about a lot of road cyclists. They seem to actively want to make life harder for themselves by not having a triple chain set. Now, I sort of see that for the top-end elite cyclists that not having that tiny amount of extra weight might make a difference. And they're elite, so they don't need a granny ring. But, honestly, the majority of the folks I see out aren't elite. They're just in pain. I suppose that part of the answer might be that it's not fashionable to have all the gears at the moment, so it's hard to find bikes with them. Anyway. Zooming down from the first hill, the road was beginning to feel a little sketchy, and since I wasn't sure how far it was to the junction I started to slow down a bit. Ed zoomed past me (probably with a "why are you slowing down? "), and then realised - just as I did - that we were about to hit the T junction at the end of the road. Fortunately, our brakes were up to the job. Excitement over, we settled in to a merry pace, chatting as we went. Seemingly in no time at all we were at the first food stop. We zoomed straight past, deciding we didn't need to stop, only to stop a mile or so down the road (I think Beth ran out of water and needed a transfer, but I'm not sure now). We timed that perfectly so we were just setting off again as we passed the event photographer, who somehow managed to completely miss us. Now we were hitting the BIG climb of the ride. Last year it was at the start of the route, and I remember it being pure purgatory and seeming to go on forever. I started to realise as I overtook a few people on the way up it that either my new bike was awesome compared to the old one, or I was far, far fitter this year. I suspect mostly the former. Once we were all up that hill, we were fast approaching the route split. We'd all signed up for 100km, but for some reason the organisers had Ed and Beth down for 100 miles. Destiny maybe? We decided not, and opted for the short route whilst confidently proclaiming we'd do the 100 miles next year (which, incidentally, Ed and I had confidently proclaimed last year too. We were now onto the swoopy downhill fun-run I remembered so fondly from my previous attempt at this ride, and swoopy swift fun it was. We ate up the miles to the next food stop, where we paused for a re-gooping and to swipe some supplies. There were zip-vit energy gels being given out, and I bagged a few in case I needed them later. Curious as to their effect, though, I decided to scarf one down straight away to see what it was like. I'm assuming that these things are designed for people who are on the verge of collapse. To someone very far from that point, they had the effect of making me giggle hysterically as I rode for about the next twenty minutes, weaving around like a drunken loon. The next section of the ride is a bit of a blur, and soon enough we were pulling over at the lunch stop. Pasta and doughnuts all round! By the time we set off again, it was beginning to really get warm. Whilst we were moving, all was well since we were at least getting some airflow, but whenever we stopped at junctions it was like stepping into an oven. Also at this point, we were beginning to hit the really chossy roads that I'd been fortunate enough to be packing front suspension for last year. I really do mean chossy, too, with quite a lot of the section between lunch and the last food stop seemingly midway back to turning into a dirt track. The heavy rain from last night was clearly in evidence too - the roads were covered in bits of branches, stones and earth which had been washed into the road by the torrential rain. Not fun riding for the full-on road bikes, but since we were riding a tourer (Beth) and a cross bike (me) we weren't to bothered. I distinctly remember Ed complaining about the bumpy surfaces on his audax bike (with the trashed bars), though. Midway through this middle-of-nowhere only-barely-still-a-road section, we found the highlight of weird for the journey. A traffic jam behind a land rover which had fallen partly into a field. Rather than the other drivers get out to help, they thought it best to stop the cyclists who were mid-way through an event to get them to push the car back out of the field. Nice one, guys. Being pleasant types, push we did. After the last stop, the heat was beginning to tell. whilst the terrain now was mostly flat, I found this section to be a long grind (partly, I guess, because I knew most of the fun stuff was over). Up one last, then down a track to the river and we were back into Henley, and nearly at the finish. Since it was regatta time, the traffic was insane, and just before the town centre I was separated from the rest of the posse. Since we were nearly done (and the traffic was scary-busy), I headed off to the finish alone. Once again, I missed my chance to get a photo as the tandems pulled into the finish just ahead of me, with many oohs and ahhs. The photographer didn't even notice me slinking in past them. I claimed my medal, and then stuck around waiting for the others. Just a couple of minutes later, Ed rolled up, and then Beth... who stopped just short of the line, and made to start taking her bike apart and put it back in the car. She hadn't noticed the huge inflatable finish line, and just assumed that entering the car park again was the finish. We shouted her over, and she walked across the line, and we'd finished! Huzzah! Time to pick up our t-shirts and medals, splat down on the grass for a rest and marvel at the sheer number of bugs we'd managed to glue to ourselves using sunblock as we rode.